Artificial Intelligence Forex expert advisor uses a very simplistic imitation of the neural network to produce buy and sell signals and trailing stop losses. It is not a real neural network, because it doesn't learn from market, instead you need to optimize it to the market to set the most fitting parameters. Its perception function uses the Bill Williams' Accelerator/Decelerator oscillators, which are weighted according to the set parameters. Expert advisor also performs checks for available free margin to stop trading if it is bankrupt. 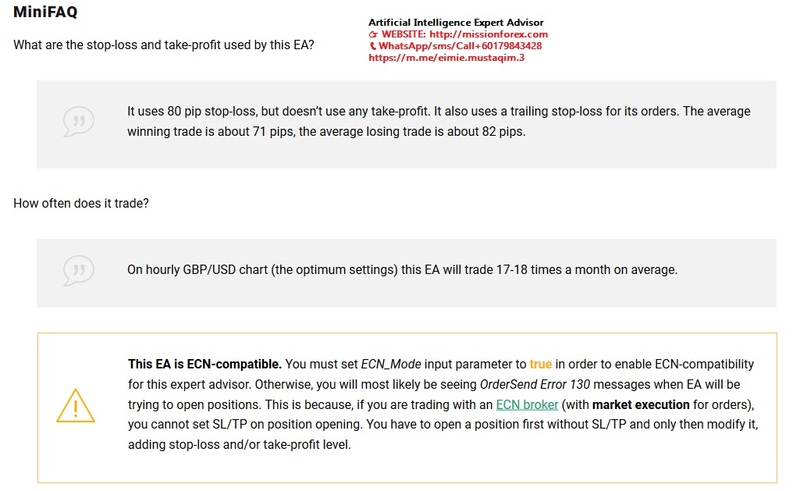 My test of Artificial Intelligence MetaTrader expert advisor resulted in $1,700 profit using GBP/USD pair on a one-hour chart using just 0.1 standard lots. It was achieved on standard $10,000 account in a one year period, with insignificant $20 maximum drawdown. This expert advisor was also checked on a three years period and its performance showed the same proportional gain. Statement:The best presets for EU H1 over the ten last months. Change Min Lot depending to your balance and risk management. Expert Advisor is fully optimized and ready to work. Expert Advisor earns 300$ per month from deposit and 1500$ by lot=0.01. With further increase of the lot size Expert Advisor will earn more and more. I do not recommend to trade prior to big news.